Vertical-storing dock levelers used in conjunction with a Thermal Guard Package can provide greater security and temperature control. Powered RIG-style restraints with LED communication lights provide the best solution for safety at Cold Storage loading docks. The HH3000 Recessed Restraint is a particularly effective combination when used with Vertical-Storing Dock Levelers. For specialized applications where lift-gates are more common than ICC bars, powered wheel chocking systems are an equally effective alternative. 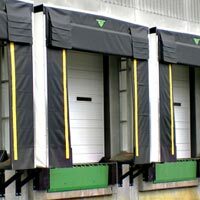 Powered heavy insulated sectional doors with higher R-values are recommended for creating an energy-saving loading dock. 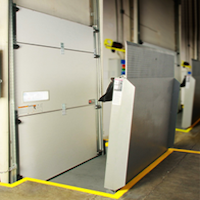 Depending on your loading requirements, a dock seal or dock shelter can keep the elements out to keep your temperature-controlled loading dock safe and energy-efficient. A Kelley master control panel allows you to integrate and sequence the operation of all your loading dock solutions to maximize equipment utilization, resulting in improved productivity and energy-efficiency. 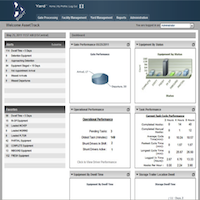 4SIGHT logistics software gives you visibility into all operations within your yard and loading dock. With automated scheduling features, 4SIGHT systems help you track trailers, minimizing energy loss due to doors left open or trailers running unnecessarily, and reducing spoilage due to time delays.